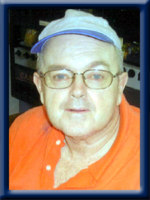 PARNELL – Gerald Alfred, 67, of Surf Lodge, Lockeport, formerly of Dock Cove, Port Medway, Queens County, passed away peacefully in Surf Lodge on Wednesday, July 3rd, 2013. Born in Liverpool, he was a son of the late Spencer and Lillian (Moreau) Parnell. Gerald was a former employee with the Nova Scotia Department of Transportation. In his younger years, he enjoyed hunting and going for drives. He is survived by his close friend Melissa (Scott) Marsters of Port Medway and her children Kelsey and Jesse. I had the pleasure of working with Gerry on the survey crew for the Dept. of Transportation in the early 80’s and he was a pleasant easy going guy and joy to work with. He deffinately loved to drive around in his Dodge RAM He will be missed. God bless you Gerry you will never be in any more pain you are now with your mom and dad we had some good talks on the phone. we think of the good old days all the Parnell Family and the rest of your family will miss you dearly love you Gerry. R I P.
May he rest in peace. He will be missed by us all. Melissa if you need anything …… you know what sisters are for. Just call. Melissa and family: I was saddened today to receive confirmation of Gerald’s passing when visiting Surf Lodge. I regularly visit the Lodge residents with my Basset Hound’s, Miss Ellie and Miss Daisy. It was always a pleasure to visit with Gerald – despite life’s adversities, he had a smile on his face, a cheerful disposition and a warm welcome for us – happy to have chat and pet the dogs. He is one of those people you meet in life that you won’t forget. I will miss him on our visits – please accept my sincere condolances.